A few months ago, I was driving with my wife, and she and I were deep into a discussion. I pulled into the gas station, went into the store and paid $25 for gas, went back to the car, continued the discussion and drove away. A few minutes later I realized that I hadn’t pumped the gas and did a U-turn and pulled up to the same pump. I went into the store and told them what had happened. They informed me that someone pulled up, filled up on my gas, and off they went. That day the price of gas to the person who got my gas was zero, and the cost to me was double. So I learned the hard way that the price of gas can vary widely from minute to minute and day to day. So, extracting from sheer stupidity, why do gas prices vary from station to station and day to day? 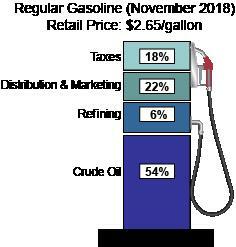 The Energy Information Agency has identified the significant components of gasoline prices as seen below. To compute the approximate gasoline price daily take the price of a barrel of oil $52.59 (January 12, 2018) and divide by 42 (gallons of gas per barrel of oil). The result is $1.25. 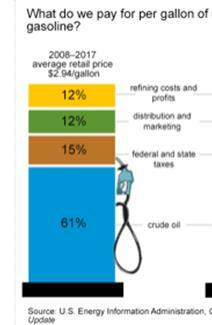 The national average for the oil as a component of gasoline is 61% generally, so $1.25 represents 61% of the price. A little algebra indicates we can find the gas price by dividing the $1.25 by .61. The result is the price of gas is approximately $2.05. Checking GASBUDDY.com the current price at the Shell on Bridge Street in Yorkville is $2.05, $2.06 at Murphy’s on Weber Road in Romeoville, $2.16 at the Shell on Route 59 in Plainfield, and $2.14 at Thornton’s on Renwick. That’s interesting, we are right on at the Yorkville station and Murphy’s but missed in Plainfield and Thornton’s. What accounts for that difference if all the stations receive their gas from the three local refiners (BP Whiting, Citgo in Romeoville, Exxon Mobil Joliet)? One reason could be that the price of gas at the refineries is changing daily. Their price to wholesalers and retailers depends on what was the cost of the oil they bought which depends on when it was purchased and where it came from. A second reason is that the price is going to reflect the cost to the station at delivery. Romeoville and Yorkville probably filled their tanks the same day, but the others probably bought their delivery on days when the wholesale price was higher. A third variable could be the capital cost to the station. The Plainfield station was built recently when interest rates were higher than when the other stations were built. The amount borrowed for the station (Shell franchise is between $1.5M and $2.0M, with $250K operating costs, and $150K for products) could have also been higher. Remember, many stations are franchises, so there is a wide variance in the amount borrowed. Another factor is refinery costs. Refineries are required to change the blend of the gas during the hot summers when gas evaporates more and then back again in the fall. This takes capacity off-line, and the supply changes and the result is a price change. Another factor is location, location, location. The demand for each station depending on where they are located varies significantly. So, there you have it. Now if you want to know how the War in Yemen, Fracking in U.S. West, global politics play into oil prices historically then read the next memo, coming soon.